Koh Chang Weather and Air Quality Forecast for April 26, 2019. Home » Koh Chang Weather. The Climate and Seasons on the Island. Koh Chang Weather. The Climate and Seasons on the Island. On average, the temperatures are always high i.e. over 30C during the daytime year round. September is the wettest month. What to expect . . . High Season coincides with the best weather, so From mid-November through to March you can expect plenty of sunshine and hardly any rain. You’re 90% certain to have sunshine throughout your stay with just the occasional rainshower. There should be a gentle sea breeze and blue skies. The sea will be calm, and especially early in the High Season, will have very good visibility for diving and snorkeling. You can also expect some strong winds from the northeast in November & December which cool things down a little. This is the time to visit if you’re planning on chartering a yacht. The hottest time of the year in Thailand is from March to mid-May. Whilst it isn’t as hot on Koh Chang as it is on the mainland in central and notehrne Thailand, it can still reach 36 – 38C. Which is hot enough. The sea also heats up considerably, so rather than cooling you off. It can feel too warm. From mid-May through to October it’s the season referred to as one of the following: rainy season / green season / low season or simply the season to shelter indoors and play with your Nintendo for 5 months. Whatever you call it, there will be rain most days. However, this is often just in isolated showers during daylight hours. Most of the heavy rain is overnight. So you will see the sun, but can’t guarantee how much or on what days. Outside High Season . . .when is the best time to visit Koh Chang? : If you just want a quiet escape from everyone then June or September are ideal. May & November are also often pretty good months for visiting as they often combine quite a lot of sunshine with cheaper airfares, cheaper rooms in some resorts and relatively few visitors. Another reason to visit in the Low Season is that there can often be days when the weather is actually better than during the High Season. For example, the photo on the top of the page with clear blue skies and a wide deserted beach was taken in mid-June. Supposedly June is one of the worst months to visit. The weather forecast shows rain every day. But you won’t get that view in the High Season. The tides are higher, so you won’t ever see a 50 metre wide beach if you visit from December to March. And there are far, far more people at that time of year. That’s White Sand beach in the photo. It’s the busiest beach on the island. But go to the beach any hot sunny day in June and you can easily count the number of people you see out on the sand. Air Quality and Air Pollution on Koh Chang. In the High Season, from mid December to March or April, the sky is often hazy. This isn’t a freak occurrence, it happens every year at the same time of year. It is due to pollution. Not from vehicles or construction. But from fires. Farmers across southeast Asia still clear their fields, ready for planting a new crop, the old fashioned way. By burning them, this is quick and cheap to do. The downside is that it’s not so good for the environment. And if there are a lot of fires over the border in Cambodia and the wind is blowing from the East or Northeast, then the AQI can get to 100 – 150 range. ( This is classed as ‘Unhealthy for Sensitive Groups’. Ideally you want to be somewhere in the 0 – 25 range. Although in Thailand, the recommended healthy level is double this at 50. On this scale, anything over 300 is classified as ‘Hazardous’ and you should stay indoors if possible. Global Forest Watch monitor major fires burning around the world, which are seen on satellite data, and their site provides real time information. Click here to see the current situation in Thailand and Cambodia, then zoom out and compare to Europe. Then you’ll realise why the sky is hazy. This photo shows the difference. A low season photo vs the similar view in high season. You probably won’t notice any smell or any difficulty breathing, unless you are very sensitive to smoggy air or have a respiratory illness. But if you are susceptible, then checking the AQI of any destinations in this part of the world, especially between January – March, is worth doing before you plan a holiday. 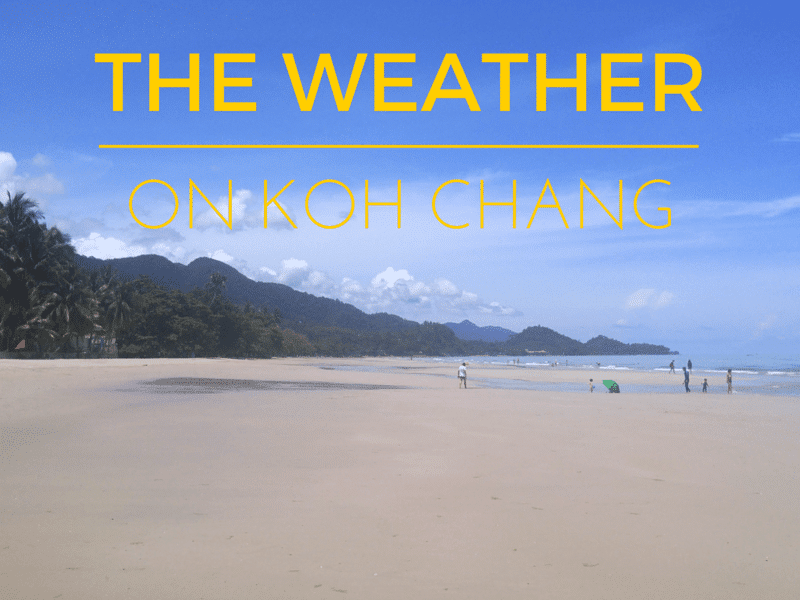 How much rain does Koh Chang get? In total Koh Chang receives around 3 – 4,000mm of rain each year, most of it falling in the rainy season. To put that in perspective, the north of England averages about 800 – 1,000mm of rain every year. However, as I mentioned above, the rain is in heavy tropical downpours rather than drizzling for days as it does in the UK & northern Europe. This area of Thailand is one of the wettest in the country but that doesn’t mean that it is constantly raining for six months of the year. The majority or rainfall comes in the form of storms or very heavy rain showers which often last only 30 minutes per day before the sky clears and the sun comes out. So having an entire week of grey, overcast sky and no sunshine is quite a rarity. If you are visiting the island in the European summer holidays, you aren’t going to be able to guarantee that you’ll come home with a deep tan. It’d be nice is there was an accurate Koh Chang weather forecast for the rainy season. But, it’s very hard to say how a day will turn out. That’s why pretty much every forecast you will see shows a 50% chance of rain, the possibility of a thunderstorm and the possibility of sunshine. You’ll often get all of those in the same day with an overnight thunderstorm followed by a grey morning and clear and sunny afternoon. Conditions at Sea: During the High Season the sea is usually very calm. In fact, in the mornings especially, it can be like a lake with barely a ripple. However, there can be rip currents from May – October. The waves are never huge, but as the beaches slope gently into the sea, this can cause rip currents to form in certain places on all the main beaches. Every year several visitors drown. There is one permanent lifeguard on duty outside KC Grande Resort on White Sand beach, but other than that, you’ll have to rely on help from fellow visitors or hotel staff if you get into difficulty. Humidity: It’s a tropical island full of jungle and trees, so you’ll sweat a lot regardless of what time of year you visit. That’s really all you need to know. Windguru: Excellent, detailed forecast for anyone planning to go out on the water. WorldWeatherOnline: Another detailed forecast for today and also the coming week. Plus historical data.